Hello lovelies! How do you like the new look? I'll admit, inspiration came from elsewhere. I've been having issues editing the template on my blog so I searched it on Google and found the answer from another fellow blogger, Shelly. Definitely a follower now. She has so many amazing photos and I love the layout of her blog. Call me a copycat if you want. It's just a compliment to the person I copied. 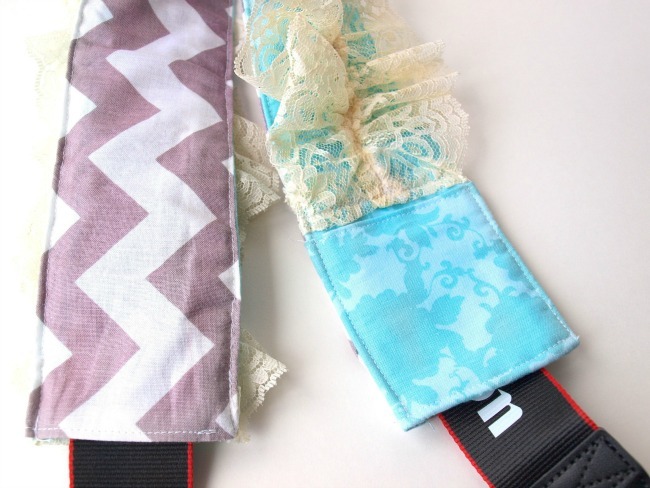 Anyway, due to popular demand, I've decided to make a camera strap tutorial. Making a camera strap is probably one of the easiest tutorials that I have made, and yet, I somehow managed to make a few mistakes along the way. Count yourself lucky to have me around to make all your mistakes for you. You're welcome. Camera strap top - 4x22"
Camera strap underside - 4x22"
1. Iron out all of your fabric and cut your fabric out to the dimensions above. Keep in mind the direction of the print of your fabric. If the print is going horizontally, then you'll need to get 22" of fabric so you can get the right direction. Riley Blake Chevron fabric (for instance) is horizontal, so you'd want to get 22" instead of 1/3 yard. Also, if you want your camera strap to be longer than mine, you might need to get more fabric. 2. Following the directions afforded you with the fusible fleece, iron the fleece to the wrong side of the fabric that will be on the underside of the camera strap (where it will be against your neck). 3. 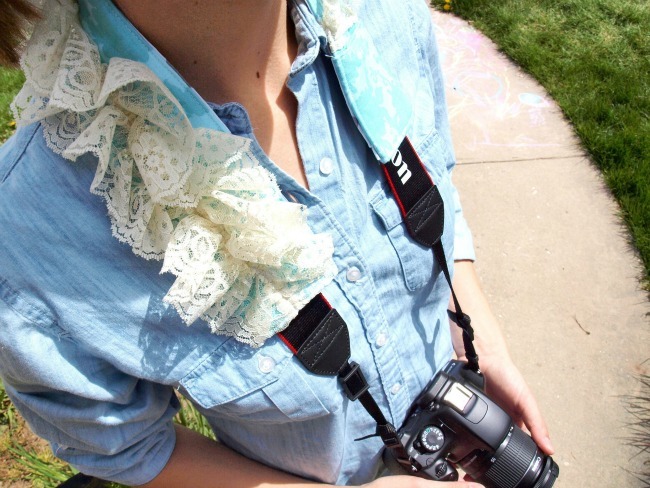 Place your 44" lace "ribbons" right-sides together and pin along one side. 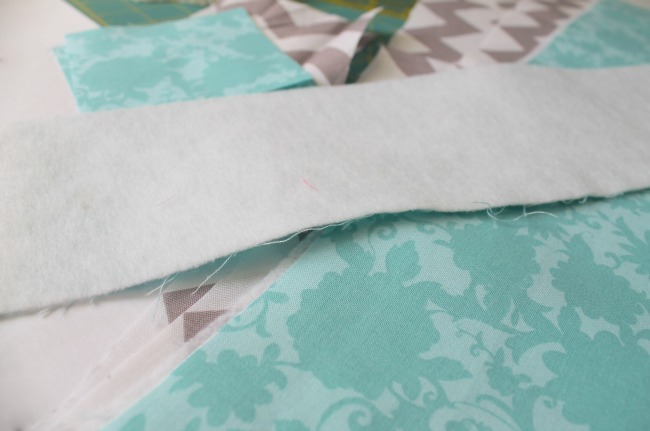 Do a straight stitch where you've pinned to keep them together with a 1/2" seam allowance. Flatten out lace with your hands and use the longest stitch possible to sew straight down where you've just sewn. 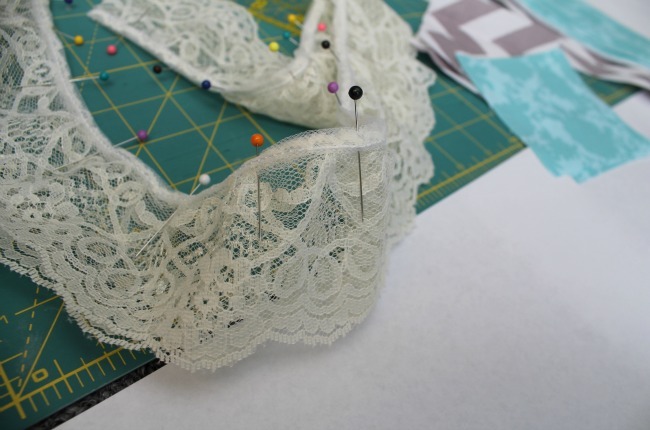 Place a pin in the center of the lace you've just sewn together and set aside. 4. Put your two pocket pieces right sides together and do a straight stitch with a 1/2" seam allowance across the top. Flip pocket so that right sides are facing out and iron. Do a finishing stitch across the top at 1/8" seam allowance. 5. Pin the pocket on top of the camera strap top at one end, lining up raw edges. Sew the pocket in place with a 1/4" seam allowance around sides and bottom. *If you're not using lace, skip step 6. 6. From the top of the pocket to the other end of the camera strap top, find the center and pin the center of your lace there. 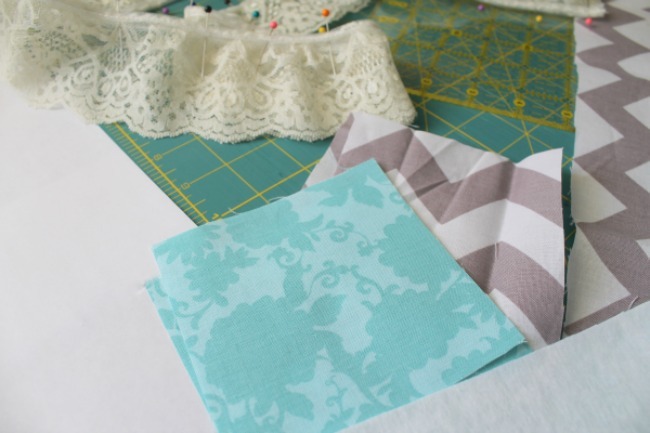 Gather the lace until it is the proper length (from one end to the top of the pocket), pin in place, then sew in place with a regular straight stitch. 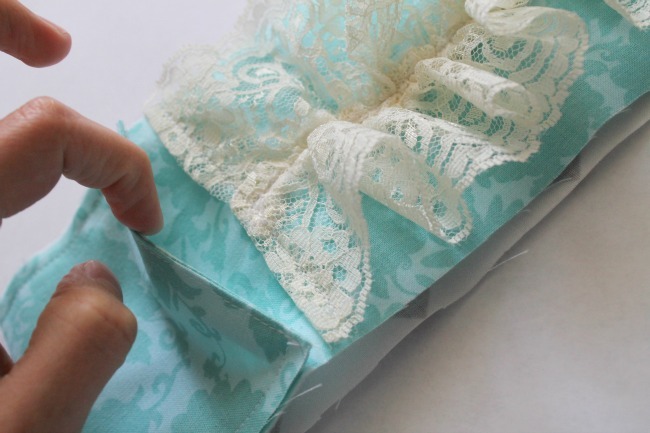 Fold excess lace by the pocket under and stitch down. 7. Making sure the lace is out of the way, pin the camera strap top piece to the camera strap underside, right sides together. Using a straight stitch, sew along the long edges with a 3/8" seam allowance (you can do 1/2" seam allowance, but the pocket will be a little more snug), leaving the two shorter ends un-sewn. Zig-zag the raw edges of long sides. Turn strap right-side out and press. 8. Fold shorter ends under two times to avoid any fraying and sew in place (or zig-zag top and underside separately and fold under once). Make sure you fold the camera strap top and the camera strap underside separately or you'll close the entryway and exit of the camera strap! Slide in your camera strap and voila! 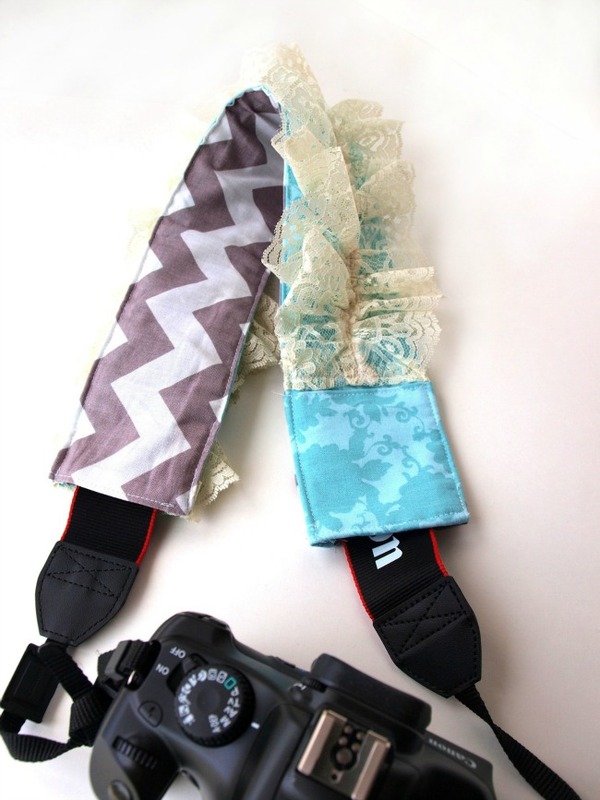 Your very own, very washable camera strap! Love it! Now go take some photos! P.S. If any of you are having the same issue editing your blog that I was, leave a comment and I'll direct you to a tutorial to help you get it fixed! P.S.S. I decided to link up with Emily over at The Freckled Fox for a Sew and Tell (cute play on words)! Go check her out and meet some new friends while you're at it! you nailed it! love the ruffly lace addition. I think I even have some of that lace lying around somewhere. thanks for the tutorial!! I will be making one SOON! Anything for you, Lindsey! Hope everything is good with your little family! ok this is SOOOO CUTE! Im so glad I found your blog! Now following and cannot wait to read more! If only I have fabric. I've been wanting to make one of these..
Thang , Tysha! I'm so glad to hear that this tutorial worked for you and was understandable. Make sure you share some pics, yeah?